Holidays to most people are likened to the perfect Christmas card. A mom, a dad, kids and maybe even a dog celebrating and laughing together. But what about those who have lost someone that year or even in previous years? The holidays are a reminder of the people that should be with you setting up the Christmas tree or filling the empty space at the Thanksgiving table. After a loss the holidays are always hard. It doesn’t matter how much time has passed, there is always pain and grief attached to the holidays. It can make it hard to find things to be thankful for when you are feeling so low. But I have a mission this year that we can all find some inspiration for the season. Each day find something--big or small--to be grateful for. Some days it is going to be hard especially on the days where it feels like nothing is right but as long as you keep searching, you can find something. It could be as small as the sun shining after a gloomy day or even the fact that you can find tissue to wipe your tears. Look for the simple blessings that you have. If you journal, write them down each day. Go back and read through them on the days where you feel like you can’t go on and you will see how much you have to be grateful for. Once you start to notice all of the things around you, the list will grow and it will become easier to see how much you truly have to be thankful for. 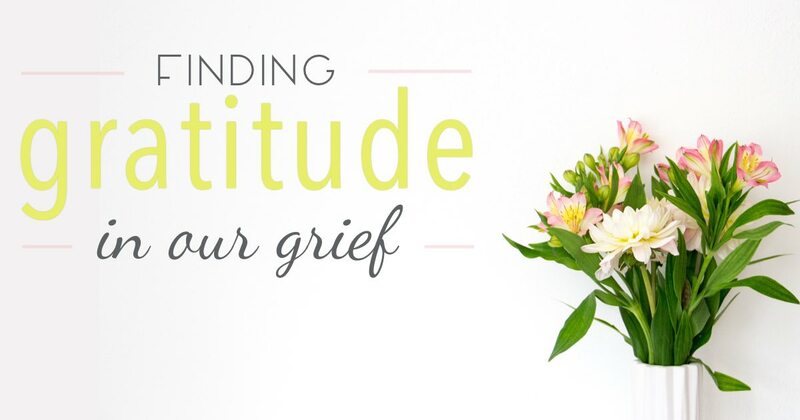 Even though it feels like it, you aren’t the only one grieving a loss. Though your situation doesn’t mirror other people, there are people who you can empathize with who are also living with grief. Find them and talk to them. By hearing their circumstances you may realize how much you have to be grateful for and vice versa. Voicing your troubles also helps you realize how much you truly have in your life. Bring Gratitude to Your Daily Life. Find a way to voice what you are grateful for every single day with your loved ones. Some use social media as way to share what they are grateful for. Others use the dinner table to express one thing that they are thankful every day. As others share what they are grateful for, you will find yourself adding to your own gratitude list. The best way to find yourself to serve someone else. We all have different challenges that we are facing and ways that we can bless each other’s life. It’s amazing to see how helping someone else can make a difference in your life. No, it doesn’t change the pain of the loss. But it does lighten some of the suffering. These acts of service can actually leave you with more than you have given. There is some serious power in our minds. We can change our perspective even during the darkest of times. By deciding that you want to be more thankful, you will be amazed at how many things you will find that you have gratitude for not only during the holiday season but also in your every day life.